The first morning we all woke up at Amrit Vela and joined in Nit-Nem and Shabad Keertan. Everybody was in to it and nobody seemed distracted. It was one of those powerful “Sangat” experiences where you lose yourself and become part of the whole. I loved it! I was so energized after that Deevan and was excited for all the weekend’s activities to come…then came breakfast. It was a little chaotic as we entered the dining hall. Although the meals were vegetarian (God help us if they weren’t), a group of Singhs were arguing with the aunties demanding to see the packaging for the bread. They were convinced that this particular brand of bread had an animal byproduct as an ingredient. I skipped the bread and quickly moved pass, but finding a place to sit became an ordeal in itself. Although there were at least 50 people at the retreat, less than half were eating in the dining hall. I looked around and saw a handful of Singhs back in the kitchen sitting together eating from Sarab Loh bowls, cups, and plates. Another group of Singhs were heading back to their dorms to eat the food they brought, as their maryada only permitted them to eat food prepared by other Amritdharis who followed their same maryada. As for me, I felt like the new kid walking in the cafeteria on the first day of school trying to figure out which group I could fit in to. What happened to that warm and fuzzy feeling I had sitting in the Deevan? Now this Sangat, who couldn’t share a meal together, felt cold and distant. Turns out mealtime wasn’t the only time we found ourselves at odds. We spent much of the weekend arguing over how many Baanis one should read daily, or whether Raag Mala is Baani, or the authenticity of Dasam Granth, or whether Keertan should only be sung in Raag. We even debated over what colors should be prohibited for Sikhs to wear. Considering I grew up in a Sikh community that still argues over whether keeping “Kesh” is necessary, this was all quite a culture shock. The whole experience was difficult for me to swallow. I thought to myself…with all the challenges we as a community face in the real world, it is disheartening to see how disjointed and fragile we really are. If we can’t agree on some of the most basic of Sikh principles and practices, how can we really progress as a community? Mid-way though the retreat, I became frustrated. I mentally checked out and just waited for the whole thing to end. There is, after all, one thing we do have in common – and that is the love for our Guru. But our Sangat, experiences, and influence are different. Therefore, there are differences in the way we practice. The way we practice is tightly aligned with our belief, and belief is not something we take lightly. Most are unlikely to change. But does this mean we have to settle for Panthic disunity? But I ask, have we ever really been united as a Panth? Only a handful of historical events come to mind where Sikhs from various groups had set aside their differences and shared a common goal – Banda Singh Bahadur’s conquer of Sirhind, and the immediate days after the 1984 Darbar Sahib attack come to mind, but for much of our history, there has been such disparity – even during the Guru’s time. It did not seem to prevent the Gurus from accomplishing their mission, so why should it prevent us? There are some groups of Sikhs I disagree with, but they do the most amazing Keertan that touches my soul. There are some groups of Sikhs I am critical of, but I envy their sense of discipline. There are some groups of Sikhs I don’t see eye to eye with, but their passion for activism and social justice is inspiring. There are some groups of Sikhs I question, but their preservation of our sacred martial arts and warrior tradition is remarkable. So it begs the question…is it possible for us as Sikhs to embrace our commonalities and dare I say, “learn” from each other’s influences, yet be mature enough to accept each other’s differences…and agree to disagree? Rather than spending our energy challenging one another over maryada and being critical of each other’s practices…can we instead focus that energy on living up to our own maryada and bettering our self? I, for one, have long ways to go. I guess I’m starting to see the glass half-full. At this year’s Nagar Keertan, I passed by several aunties and uncles complaining of how chaotic the event was and how disorganized we were. But what I saw were thousands of my brothers and sisters…in different clothes, speaking different languages, some from different cultures, and even with slightly different practices…all marching the same direction. And I can’t help but wonder…rather than fight over our differences, is it possible we can rise above…and celebrate the beauty in our diversity? My father always kept a large collection of “Sikh” books at home, covering all aspects of Sikhi – history, Gurbani, and contemporary issues. I rarely delved in to these books, because the English was so hard to understand – often written by authors from the early 1900’s or non-English speakers. But on a hot summer day, while on break – one book caught my eye. It was a series of essays – easy to read, easy to understand…and most of all…captivating! I read the entire book in one sitting. I was able to relate to it so well, as it spoke about Sikh history’s significance in today’s society. One essay, titled “What Is A Head Worth” blew me away. 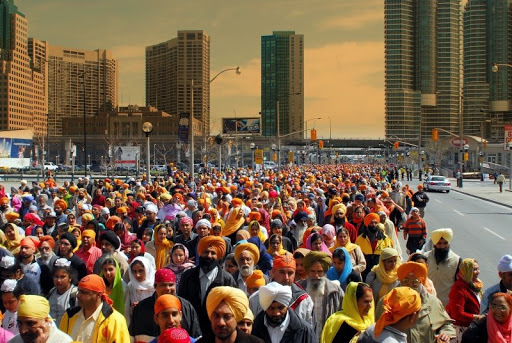 Although I heard the story of Vaisakhi Day in 1699 dozens of times, this essay brought it to life for me, and I connected with it in a way I hadn’t before. More importantly, the author made it relevant to today…and relevant to me. He explained that 300 years later, the Guru is still asking for our head. And we are being tested every day by our choices and actions the same way Guru Sahib tested his Sikhs on that day. The author concluded the essay with a question that shook me, and I immediately wrote it in my journal. Three hundred years later, once again the Guru wants your head. Many will slip away, just as they did three hundred years ago. Many more will look away, just as they did then. The question is: How are you going to answer the call? I was so moved by this book, I did something I never did before…I wrote a letter to the author. This was long before email and commenting on blog posts…this was a hand-written note. I wanted to tell the author how much I loved the book and how much this essay meant to me as a young Sikh discovering my faith. To my surprise, a few weeks later…I received a call. Sure enough, it was the author. He was appreciative of my note and we engaged in discussion. I couldn’t believe a professor and published author would take the time to call me…a mere college freshman. I invited him to speak at a conference a few of us university students were organizing and he obliged. The conference was a disappointment, as it turned out most of the participants were more interested in partying than attending the workshops – very few actually attended his talk. But he gracefully understood and encouraged me not to get frustrated and continue organizing such events…so I did. As years passed, the author and I lost touch, but we would run in to each other from time to time in various cities – at workshops, retreats, seminars. He was always a featured speaker and it didn’t matter what the topic or theme was – he was always an expert. And each time we would meet, he would mention the letter I sent him as a kid – and remind me that he still keeps it! I have followed his writings over the years, through his books and his articles on sikhchic.com, and they still captivate me. Often times he titles them with something provocative, as though he may make some controversial declarative statement at the end – but he rarely does, sometimes to my frustration. He instead raises pertinent issues, analyzes both sides of the argument down to the intricate details – and then leaves the reader to make up their own mind. As I’ve gotten older, I’ve learned to appreciate this more. As I’ve seen in Sikh politics and Sikh leadership, we often rush to make declarative statements without the necessary discourse and debate. And we become more comfortable just following the “loudest talker” rather than thinking for ourselves. Late last year, on a whim – I sent an essay of my own to the author for his feedback. I respect him as a writer and was hoping to develop my own writing. I had rarely shared my essays with anyone else before. He promptly replied with some feedback and encouragement. He also suggested I send my essay to sikhchic.com. With that encouragement, I’ve continued to write and share pieces – which has been a tremendously reflectively experience and one where I’ve discovered a lot about myself in the process. It’s funny, that same person who patted me on the back and encouraged me then as a kid, is still doing the same 15 years later. I thank Dr. IJ Singh (UncleJi) not only for his guidance and encouragement of me, but for his guidance and encouragement of so many Sikhs of my generation. Although he is a self-proclaimed “gray-beard”, he has a knack for connecting with youth activists unlike any other, serving as a trusted mentor and advisor to several Sikh organizations. He has filled the gap as a “visionary” and “thinker” for our institutions, something we as a community often lack. True indeed! I wish UncleJi the best of health, the highest spirits…and most importantly…the strongest of shoulders! A political science and policy studies major with a focus on law and justice, Kaur has a longstanding interest in human rights and justice issues that stems from the violent history between the Indian government and Sikhs in Punjab. For her fellowship, Kaur will travel to four countries — Chile, Rwanda, Israel and France — to work with minority populations on the issues of access to human rights and justice. I recently interviewed Sukhdeep and we discussed how she first got involved with human rights. “I knew I wanted to work with law and justice but wasn’t really sure whether to focus on civil rights or human rights,” Kaur said. However, after taking a human rights course her sophomore year and her personal study of the violence toward Sikhs in India in 1984 and subsequent human rights violations, she decided to make this the focus of her field work. Last summer, Sukhdeep traveled to India where she interned with Ensaaf – concentrating on documentation, consolidating data, and training local staff. She also volunteered at Aman Biradri, working with the Nirvair initiative – focusing on rights for widows of 1984. Finally, she collected data for her senior thesis, interviewing families across Punjab. In her thesis she argued that the Indian courts have been insufficient in distributing justice and how a grassroots movement is necessary. One thing that struck me about her experience in India was the apathy towards human rights from Punjabis themselves. “I was surprised that so few people living in Punjab knew about Jaswant S. Khalra, the issue of mass cremations, or the on-going court cases,” Kaur said. In Sukhdeep’s three years at Rice University, she not only excelled in her academics, but also in several extra-curricular activities – participating in club volleyball, bike team, equestrian team, and the bhangra team. She is also well-known for her active participation as an instructor and counselor at Gurmat camps throughout the United States. After her fellowship next year, she hopes to begin law school with the ultimate goal of pursuing a career in public policy on human rights and justice issues. Furthermore, she hopes this fellowship will give her better insight to how other countries deal with human rights issues and what can be learned for the case of Sikhs in Punjab. Congratulations Sukhdeep Kaur! Guru Ang Sang! History tells us that Guru Nanak Patshah created Dharmshalas in Kartarpur where Sikhs would rise early and meet for Keertan, Veechar, reflection, and Guru-ka-Langar. It was a central element to the ideal society that Kartarpur would become. Over a century ago, Sikhs first arrived in North America – working at lumber mills, railroads, and as migrant laborers. They settled their families and chose to establish Gurdwaras (as early as 1908 in West Vancouver, BC and 1912 in Stockton, CA) to preserve both their spiritual and cultural roots in the land far from their history. Now with hundreds of thousands of Sikhs in North America and the needs of our communities growing, the Gurdwara has expanded the services it offers far beyond its humble beginnings. Many Gurdwaras have Khalsa schools and libraries. Others plan for fitness centers, basketball courts, and healthcare clinics. One of the local Gurdwaras here hosts an annual Panjabi cultural show and mela, with weekly Giddha and Bhangra practices held at the Gurdwara facility itself. 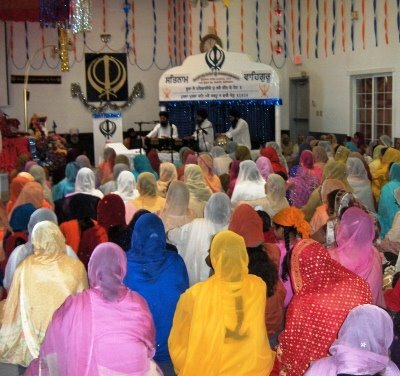 The North American Gurdwara has become not only a spiritual center, but also a community center, serving all the needs of the Sikh and Panjabi population. On the one hand, I like having a Gurdwara as the center for our community’s activity. Although not all people have an initial interest in Sikhi, all these other events and programs at least keep people coming. And even a short “ritualistic” trip to the Gurdwara could develop in to something more. On the other hand, I can’t help but wonder…are we asking too much from our Gurdwaras? With such different and competing interests, leaders fight for position so they can make their agenda the focus, and control Gurdwara resources accordingly. This drives much of the political drama and power struggles that surround our Gurdwaras today. As a result, many programs (such as Khalsa schools) end up mismanaged, poorly resourced, and inefficient. Secondly, with all the programs our Gurdwaras offer, I question – are we taking away from the primary purpose of the Gurdwara…learning Gurmat (the Guru’s way)? How well do our Gurdwaras focus on Simran and Veechar? How well do our Gurdwaras connect the youth with the Guru’s message? What about services for non-Panjabi speakers or introducing non-Sikhs to our faith? What about programs emphasizing Sikh culture – like Gatka or Gurmat Sangeet? Are our Gurdwaras really institutions for learning? If the answer is less than perfect, shouldn’t we re-prioritize and change the focus of our Gurdwaras? Many Gurdwaras serve small communities in rural areas where limited resources force the Gurdwara to serve multiple purposes. However, in larger communities, where resources are plenty – should we consider separating out our organizations? Maybe create separate Punjabi societies, Khalsa schools, clinics, and even Sikh community centers that focuses on outreach, youth counseling, and seva projects? Perhaps under separate structures and management, these organizations will be able to thrive and meet their goals more efficiently with less resistance. And with our community’s growing needs, why not grow our presence with more diverse organizations? I will be taking care of all your problems today. So sit back, relax, and enjoy the rest of your day! This is what the sign on the wall read at the Salvation Army on the North side of Chicago. Prior to volunteering there, I only knew stereotypes of the homeless and hungry…just what you see on TV. But it didn’t take long for those stereotypes to break down. The people we served meals to were happy, smiling, polite and full of energy. What surprised me most, was their deep sense of spirituality. Not only did I find this in my conversation with folks, but even in their greeting. My standard, “Good morning, how are you?” was often replied with “Blessed” or “In His Grace”, many with bible in hand. I’ve been reflecting quite a bit on “faith” lately, as I’ve noticed a growing pattern of Sikh Youth beginning to doubt their belief in God. In my conversations with some of these youth (many of whom come from wealthy backgrounds), I’ve tried backing off the subject of God altogether, and simply asking – “What do you believe in?” And it’s been pretty consistent. Most of their belief lies in achieving materialistic and financial goals – a high-paying job, big house, nice car, admiration and respect from the community etc. I would listen to this in awe, thinking to myself, that’s it? There is nothing else? Nothing deeper? I’m not implying that poor people are more inclined to be spiritual or more likely to believe, while the wealthy are incapable of it – of course, all of us can think of examples to prove that theory wrong. But in simplest terms – in order to believe in God, you must first believe that there is something bigger than yourself. I wonder…is their doubt really based on any atheist philosophy or scientific theory, or it is just Haumai (I-am-ness). Is it our Haumai that convinces us that we know everything when we really don’t? Is it our Haumai that inhibits us from connecting with the Shabad? Is it our Haumai that prevents us from believing? My intellect is polluted; I cannot understand Your state, O Lord. Take pity on me, dispel my doubts, and teach me true wisdom. I believe Waheguru is within everyone, believer and non-believer alike. But the force that connects us to that Waheguru within can be strong, weak, or non-existent depending on our Haumai. A friend once compared this to metal filings and a magnet. If you put a stack of papers in between the two and move the magnet, the filings will only move a bit – if at all. But as you remove the layers of paper, the filings will eventually move the direction of the magnet. And as the layers become less, the force between the magnet and filings become so strong…they will eventually be in sync. Similarly, we must remove the layers of Haumai to be connected with Him. Thoughts…opinions? I’d love to hear. As troubling as it is to read this, I was pleased to find that Amnesty International had covered it at all. As many of know, AI, as well as other independent human rights groups and initiatives were either banned or prevented from conducting research in India in the late 1980’s and early 1990’s. It seems as though there is hope for an independent investigation on the 1984 anti-Sikh pogroms and perhaps the subsequent disappearances during the counter-insurgency. You might ask – with a corrupt government, poor human rights record, rejection of independent investigations, rejection of the ICC, and an unbelievably strong lobby – what course of actions must Sikhs take for justice? I don’t know… But I do feel our generation has a unique opportunity to present our case to the world in a way the previous generation could not. The material is out there…AI Reports, HRW reports, Ensaaf reports, and personal accounts – but it’s upon us to either let this information lay on shelves collecting dust in law libraries…or to make it known to the world. Let this 25th anniversary of the Sikh Holocaust serve as a call to artists, musicians, film-makers, MCs, poets, writers, educators and story-tellers…the Panth needs you…let the truth be heard!